This asteroid mission brings together the best of NASA's science, technology and human exploration efforts to achieve the President's goals faster and at a lower cost to taxpayers than continuing with business as usual. This image shows what capturing an asteroid could look like. 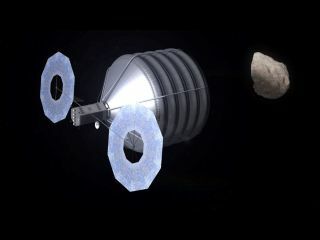 NASA will enhance its detection and characterization capabilities, accelerate solar electric propulsion technology development and begin the design of the overall mission. Image released Aug. 22, 2013. Mark V. Sykes is the CEO and director of the Planetary Science Institute. He contributed this article to SPACE.com's Expert Voices: Op-Ed & Insights. It is frustrating, at a time when other nations are in ascendancy in space, that the administration of U.S. President Barack Obama seems committed to undermining the nation's own solar system exploration program. The Obama administration cut NASA's planetary-sciences budget by 20 percent in 2013. It has taken the National Research Council's (NRC) recommendations for prioritizing planetary investments in bad economic times and turned those recommendations upside down. The administration continues to favor large, directed projects at the expense of programs and missions that are openly competed. The trigger will be pulled with the "restructuring" of those research programs. Almost half of the planetary scientists in the United States earn more than half of their salaries through such highly competitive programs, which NASA offers annually to gather fundamental knowledge about the solar system, create the context within which the nation can prioritize and design cost-effective missions, and provide benefits to taxpayers who pay for the missions, by extracting science from the data. The restructuring results in a 10-month gap in new awards across many major programs, affecting scientists specializing in planetary geology and geophysics, planetary atmospheres, cosmochemistry, fundamental research on Mars and other areas. This restructuring is occurring at the direction of NASA Planetary Division Director James Green. There is no immediate need for it. A working group report of the Planetary Science Subcommittee (PSS) of the NASA Advisory Council, often quoted by Green and of which I am a co-author, suggested in 2011 that the agency should consider consolidating programs for potential efficiencies. However, in the next few sentences, that same report recommends such consolidation be subject to a "Senior Review" (language Green chooses not to quote). Such a formal review by external experts (a common NASA practice) would require a full articulation of the plan and how it would be executed, how it would specifically address its stated goals, a demonstration of revenue neutrality (i.e., reorganization does not result in the reallocation of research funds elsewhere) and a workforce-impact assessment. The restructuring is seriously ad hoc, which may explain why Green wishes to avoid any review of his plan. In a heavily attended online town hall, the community response was deep concern and overwhelmingly negative. (At one point, disappointed with the response, Green angrily told people that they needed to get behind his plan.) The motivation for this plan was perhaps inadvertently slipped during the town hall, when Green stated that the nearly yearlong delay in proposals for several major research programs would allow for their delay in funding until 2016, giving him flexibility — in other words, thereby giving him the ability to cut significant funds from planetary research in 2015 for other purposes. All of the NASA planetary assessment groups, which provide community input to the Planetary Division, have called for a delay in the implementation of this restructuring for at least a year. The delay would allow it to be subjected to a Senior Review — ascalled for by the PSS. Green has offered no explanation as to why he is ignoring such universal feedback, nor why he is avoiding any formal review of his plan. It is also not clear why others in the administration, who are knowledgeable about what is going on, would be willing to let this train wreck proceed. It seems that rigor and review have altogether disappeared from the NASA Planetary Division strategic planning. Odd initiatives come out of the blue, with apparently little thought behind them. The announcement of the "Mars 2020" mission — doubling down on the public-relations success of the Mars Science Laboratory (Curiosity) landing — took even the Mars community by surprise at the 2012 American Geophysical Union meeting in San Francisco. Having committed to the multibillion-dollar mission (still with no supportable budget profile), NASA then had to come up with a credible science rationale for it. Then, there was the Asteroid Retrieval Mission (ARM), which also involves the human exploration and technology directorates. A community workshop last summer explored its technical and programmatic details (such as they were). The mission was shown to be poorly thought out at a level that was clearly embarrassing for the administration. Other uncompleted projects have been funded or burble just beneath the surface in the NASA Planetary Division. Over the course of the current decade, most operating NASA planetary missions will come to an end. Under current administration plans, the U.S. footprint in the solar system will radically shrink, and the nation's capability to resurge when, and if, resources become available will be crippled, perhaps permanently. This will be the legacy of the Obama administration — the loss of a crown jewel of American science and technology. This is not inevitable. There is bipartisan support for the U.S. solar-system exploration program in Congress, demonstrated this past year when Congress restored most of the administration cuts to the NASA Planetary Division, which were then largely reallocated elsewhere by the administration. Even at the current reduced budget, however, a commitment to and focus on slowly growing the research and analysis programs (as called for by the NRC), continuing operation of current missions, and the restoration of the Discovery program of smaller competed missions (also called for by the NRC), would maintain the breadth of the nation's skills and capabilities, and keep the country on the cutting edge. In the meantime, the implementation of Green's restructuring of planetary-research programs must be halted and subjected to formal review over this coming year. There are obvious disasters to be avoided.